Torr04 - The notes and writings in this group follow one interpretation of the history of both Communism and Socialism from the latter 14th century to the mid 20th century. Attributing the rise of free thought to the Wycliffe translation of the Bible in the latter 14th century, these records proceed to discuss the Chartist movement and the 2nd Chartist petition in particular. The roots of the first Socialism movement then appear to have been built upon a religious foundation before developing a keen political focus. Torr's book on The Great Depression of 1873 - 1896 explores the impact of the Depression on workers' wages and their Trade Unions, as well as upon society as a whole. Through her notes, Torr explores the beliefs and practices of latter 19th century socialist groups such as: The London Republican Club, International Workers of the World, the National Reform League, and the Fabian Society. The development of Karl Marx's work is then traced through a timeline of events that serves as an introduction to research upon different varieties of Marxism and Socialism. A definition of Democratic Socialism leads the way into a debate on the need for welfare reform in the 20th century. CP/IND/TORR/02/03 - These notes cover the slave trade, the nature of property ownership, and Catholic emancipation under Robert Peel. Notes on Late 19th Century Democratic and Socialist Organisations and their Theories of Socialism. CP/IND/TORR/02/04 - These notes explore the beliefs and practices of various latter 19th century Socialist groups: the London Republican Club, International Workers of the World, the International Working Men's Association, the National Reform League, the International Trade Union Congress, and the Fabian Society. Commentary on these groups is proceeded by notes on Socialist theory which include content on sectarian splits and a critique of the Poor Law. CP/IND/TORR/02/05 - Notes on Chartism: Marx and Ernest Jones - D. Torr draft; notes on 'People's Paper'; notes on period of 2nd Chartist petition. These records consist of two parts. 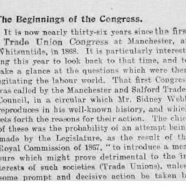 The Latter discusses the chartist petition and the ambitions of its authors during the period 1840 - 1848. The former discusses The life and work of the the Chartist known as Ernest Jones: from his association with Marxism in 1948, to his articles in the People's Paper during 1852 and editorship of the People's Paper during 1858. Notes on 20th Century history. CP/IND/TORR/02/06 Notes on developing views of labour during the 20th century. From a definition of Democratic Socialism through to debate on the need for the unemployed to recieve some form of assistance, and some employment statistics from the 1930's. Notes on Religious and Rationalist Themes. CP/IND/TORR/02/07 - These notes chronicle one interpretation of the rise of individuals' Bible reading in English and its percieved enabling of free thought in the latter 14th century. They cover the relaxation of the need to depend on others' interpretation of the Bible's meaning, and they cover a beginning of the move towards rationalism, framing it in relation to Adam and Eve's move from dependence after consuming the forbidden fruit. This is followed by an interpretation of how the country moved from rationalism to mechanisation of labour. Biographical notes on Karl Marx, 1871 - 1880. CP/IND/TORR/02/08 - This timeline illustrates key events relating to various publications by Karl Marx. Three miscellaneous letters, two by George Shipton. CP/IND/TORR/02/09 - These letters feature George Shipton dicussing appeals; one of the appeals being addressed to Herbert Asquith MP as the First Lord of the Treasury. Notes by Brian Pearce on Marxism and War 1859 - 1939, marginal notes by Dona Torr. CP/IND/TORR/02/10 - These marginal notes are of dubious ownership and while they have been attributed to Dona Torr they may not be her work.The principle work featured here is an analysis of different varieties of Marxism and Socialism from the 1890's to the 1930's. The focus is upon arguing that Marxist Marxism reacted to war through analysing historical and contemporary information, in order to calculate whether victory or defeat would most benefit the cause, and acting on the findings. T.A. Jackson - 'Secularism and Socialism in Britain' (m.s.). CP/IND/TORR/02/11 - This manuscript tells of the founding of a religion-based movement, that came to be known as Socialism, following its foundation in 1837 until 1890. CP/IND/TORR/02/12 This copy of Dona Torr's work on The Great Depression of 1873 - 1896 explores the impact of the depression upon workers and the Trade Unions' reaction to the situation. This work contains statistics demonstrating how UK exports were affected by the Depression.